1. Since my parents were just here and it was just a holiday weekend, we aren't really back on track with our eating. 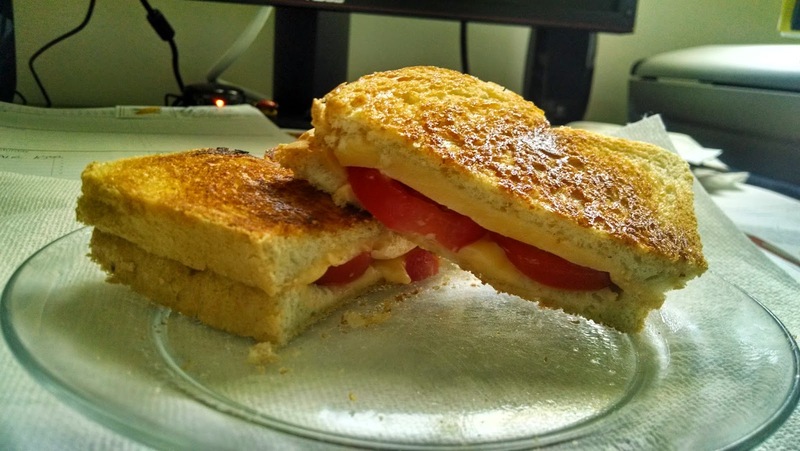 I'm trying to use up some leftover bread, so instead of my usual English muffin with turkey and Swiss, I am making grilled cheese for lunch. Today was smoked gouda and tomato. Yum! 2. 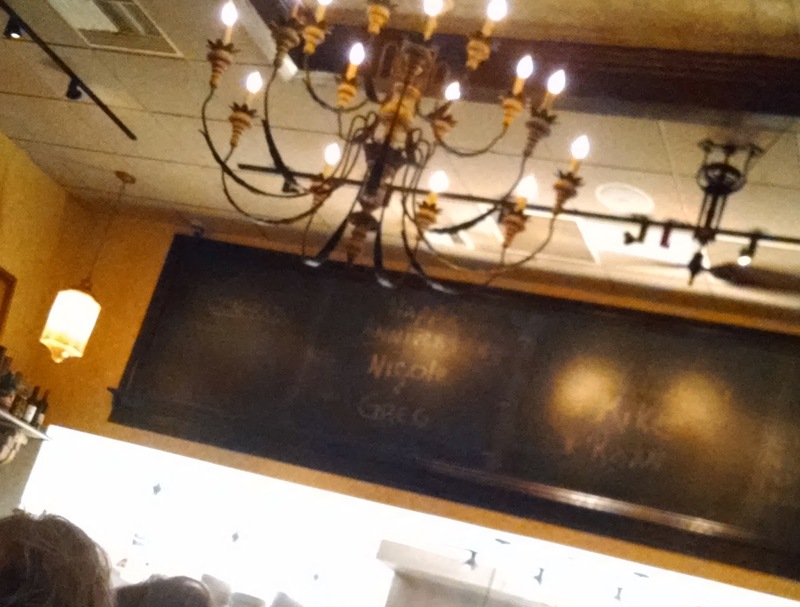 Our anniversary dinner at Arlecchino a week ago was fantastic. I had my usual: smoked provolone appetizer and veal with lump crab entree. 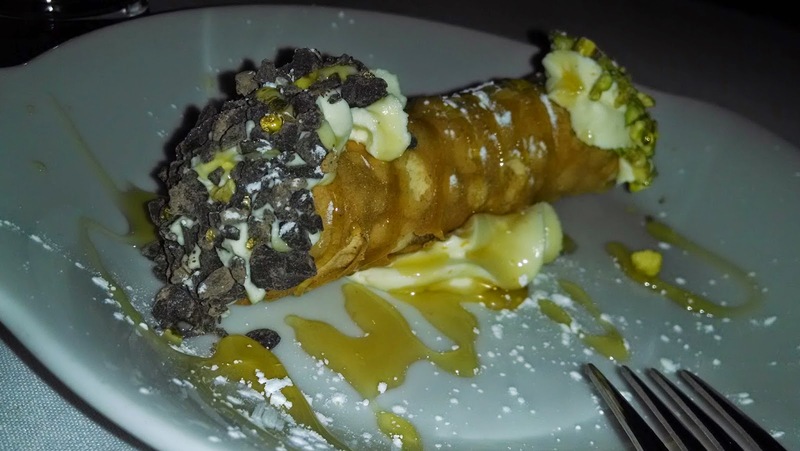 We shared a cannoli for dessert. I didn't have a real camera with me, so I tried using my cell phone camera, but dessert is at the end of the meal and I had consumed a lot of wine (we ordered a bottle and that's a lot for me) so I was having trouble finding the camera settings to try to take a decent photo. This is what I got! Chocolate chips on one end, pistachios on the other. Great for us - I prefer the chocolate while SP prefers pistachios. 4. The garden continues to grow! Look at those guys! Sure would be nice if the weather would warm up so they could be transplanted outside to their real homes and lots of extra space to grow. Above photo from outside, through the dining room window. There's probably another 3 weeks before we can safely get these guys outside. I can't wait for fresh herbs! 5. I was so preoccupied with getting ready for my parents and then them being here that I didn't pick up a library book to read until it was past due. A week past due. I thought it was a 3 week book but turns out it was a 7 day book. Oops. Between the lateness on that book and on The Goldfinch (1 day late), I owed $1.05. I always feel so incredibly guilty when I keep a book past due and owe money. 6. The book I didn't realize was a 7 day book was Steeped in Evil, the latest tea shop mystery by Laura Childs. I always enjoy these books, quick reads, not too deep, light and fun. Good thing, too - I realized on Easter it was already a week past due so I spent Monday afternoon and evening reading it so SP could return it on Tuesday. 7. As usual I am very happy to be going in for my 'every 7 weeks color the gray' appointment this weekend. It also means we'll be driving right past Portman's and I'm pretty darn sure it's ham salad weekend!